All the Lunar Men were crazy. They even called themselves “Lunartiks.” How else to explain some of their activities? Item: intentionally self-inflicted suffocation (while developing a vacuum sealing apparatus). Item: static electricity parties (while studying effects of electricity). Item: condensed urine injections (while exploring the uses of microscopes in medicine). They met on the Sunday before each month’s full moon so there would be light to travel home by. Lunar meetings featured forays into the world of the possible. Experimentation was the game of the day. The world was their oyster to study, test, exploit, devour and profit from. Well, maybe they all didn’t do that. Still, to be a Lunar Man (yes, they were all men) meant being into that sort of thing. Each Lunar Man brought his own interests and perspectives on scientific topics of the day. Everyone was equally excited about the others’ revelations. So if they didn’t all inject condensed urine, they heartily embraced its premise of scientific exploration. One thing they didn’t agree on was politics. The polemics of the French Revolution ultimately broke them apart. Lunar Men’s inventions included some of the most critical innovations of the time: steam engines, standardized coin minting, geologic, chemical and biological discoveries, improvements in transportation, advances in educational methodology, etc. 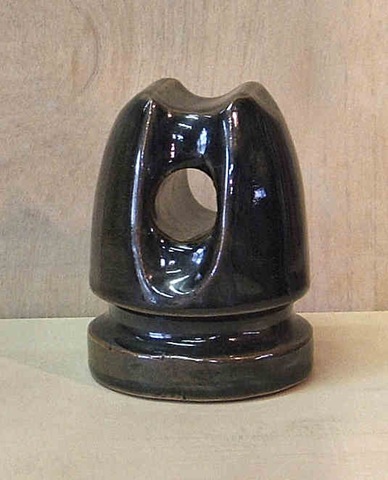 And of course Lunar Man Josiah Wedgwood’s thermocouple revolutionized precision firing in the pottery industry. Potters remember Wedgwood for his thermocouple, his organizing genius and his long list of pottery achievements. But we should also remember his penchant for experimenting solely for experimentation’s sake. In other words, for howling at the moon. The Lunar Men: Five Friends Whose Curiosity Changed the World. Jenny Uglow. Farrar, Straus and Giroux/New York. 2003. Ingenious Pursuits, Building the Scientific Revolution. Lisa Jardine. Doubleday/New York. 1999. First, a little history. In 1625 Spanish mercenaries captured the Dutch protestant stronghold of Breda after a long siege during Holland’s war of independence from Spain. The Spaniards proceeded to lay the already emaciated town to utter waste. The savage butchery that ensued scarred victims and victors alike. The engraver Jacques Callot (1592/3 – 1635) memorialized these events in his “Siege of Breda.” Callot was known for his depictions of festivals, swagger and pageantry, and for his roaming life style. He was born in the Alsatian town of Nancy but ran away to Rome at age 12 to study art. He joined a band of gypsies, and later an aristocrat’s coterie. After getting busted and sent home he apprenticed to a goldsmith. Callot worked for the Queen of Spain, Ferdinand I of Tuscany and Cosimo II de Medici in Florence. He did a stint in the Low Countries to gather materials for his “Breda” etchings, then off to Paris and King Louis XIII. In 1631 Callot returned to Nancy. The “Miseries” chronicled the arc of a typical soldier’s life. First, an exciting enrollment into the army. Then troops randomly slash and pillage their way across the countryside. Enraged peasants eventually fight back. Military leaders severely punish the more outrageous brigands. The soldiers began as noble adventurers but surviving veterans end up as crippled beggars in the street. In the final scene the King doles out rewards to commanders in preparation for the next war. There is no redemption here. The Miseries were almost photographic presentations of events forever etched onto Callot’s psyche. His depictions of war’s brutality remained unequaled until Francisco Goya’s “Disasters of War” addressed similar depravities by Napoleonic troops in Goya’s beloved Spain 180 years later. 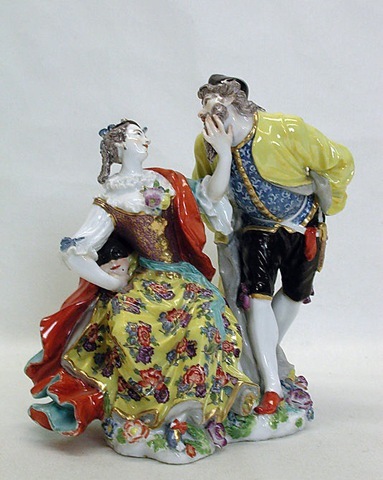 Meanwhile in the European porcelain and faience world, decorators for the next hundred years were inspired by Callot’s pretty etchings of foppish gallants. The Indignant Eye, The Artist as Social Critic in Prints and Drawings from the 15th Century to Picasso. Ralph Shikes. Beacon Press/Boston. 1969. Before the internet, before the global village, before most people even thought of the planet as a whole, there was Mexican majolica. The Talavera workshops of Puebla, Mexico produced tin glazed pottery which included the world’s first global imagery. 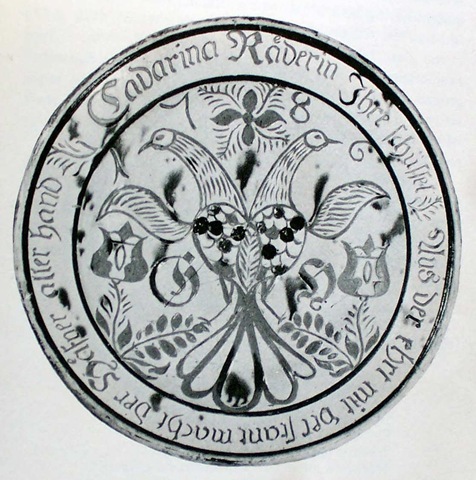 Potters from Seville, Spain began wheel thrown, glazed pottery in Puebla around 1520. Everything needed for tin glazing could be found nearby. This new pottery activity was a ‘men only’ club unlike ‘campesino’ pottery made primarily by women. Local assistants were trained from scratch. Most of the extremely talented native potters had been killed (as part of the Aztec literati, they were doomed to extinction). Mexico was a transit hub for colonial riches flowing from the Pacific to metropolitan Spain. As such, large shipments of Chinese export porcelain passed through Mexico. Mexicans were crazy for blue and white. 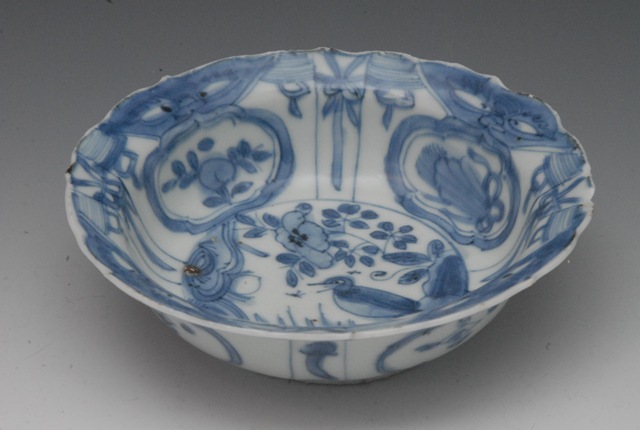 Talavera’s “refined” ware intentionally imitated the Chinese. The influence of three continents and four cultures could be seen on Puebla majolica. Islamic aesthetics encouraged filling the whole space with designs. European “Istorio” designs focused on narrative stories. Decorative frills defined the Chinese influence. And local flora and fauna, such as cacti and jaguars, provided ready inspiration to Mexican potters. All this on one blue and white surface. 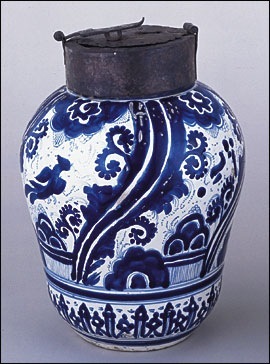 And all this a hundred years before Chinese potteries began slavishly reproducing European designs, or European potteries began slavishly copying Chinese designs. Things progressed so well that Puebla’s potters formed a guild in 1653. The Potters Guild regulated production, quality control, sales and (curiously) penalties for counterfeiting. The Guild folded 100 years later but it’s rules influenced production up to the early 19th century. Mexicans loved their blue and white majolica. They especially loved drinking chocolate from majolica mugs. Well-to-do 18th century Mexican women obsessively drank chocolate from these colorful mugs everywhere and at all times. But there were limits. A decree had to be passed banning chocolate drinks in church during masses. Those ladies’ world must have shrunk a little on that sad day. Chocolatero, Puebla, early 18th century. 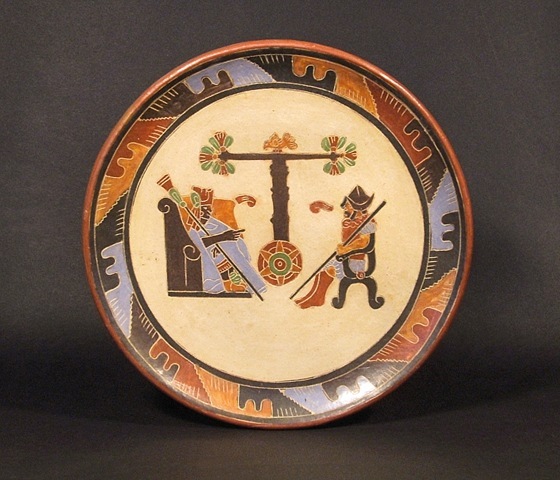 The Emily Johnston De Forest Collection of Mexican Maiolica. Edwin Atlee Barber. Hispanic Society of America/New York. 1911. You are currently browsing the archives for the pottery and politics category.